Actor Alan Rickman directed himself and a host of other talents in “A Little Chaos,” a gorgeous, opulent period drama about a female landscape architect commissioned to work on a little project known as Versailles. Matthias Shoenaerts plays master gardener Andre Le Notre and Kate Winslet plays Sabine de Barra, a sensitive widow contracted to create a whimsical outdoor ballroom for King Louis XIV (Rickman). I’ll allow that some of the plot points are less than riveting; one might not be on the edge of one’s seat over whether gardeners should honor French landscaping tradition or introduce “a little chaos.” However, amidst the leisurely pace emerge true characters, especially Winslet’s, who harbors terrible pain over the death of her husband and, we learn, their young daughter. 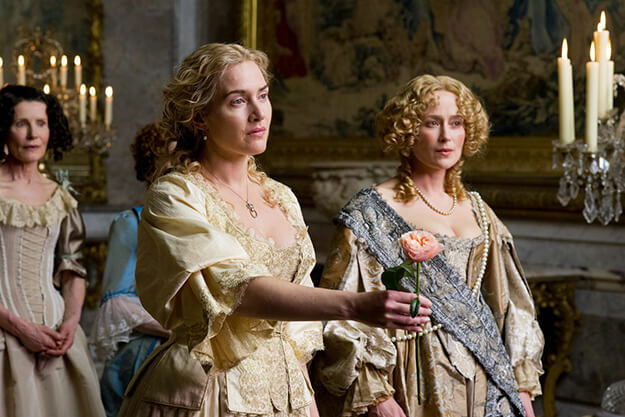 (Photo/BBC Films) “A Little Chaos” is available to rent. Perhaps it’s not surprising that the best role, although not the largest, goes to Rickman himself, who manages to come across as both regal and contemporary even in a preposterous curled wig. In fact, I think the film shines brightest when it is moving the slowest, such as a scene between Rickman and Winslet, when he is mourning the death of his wife and pretends to be a gardener, and Winslet, not recognizing him, carries on a conversation about pears and perennial flowering plants. The deep intellect and sophistication of these two actors comes through as they converse, leisurely, as equals. Of course, this is also a love story, and the reticent, eccentric Sabine begins to blossom with her new commission. She earns the respect of her male counterparts, as well as the jealousy of some well-connected females at court. Even more reticent is the smoldering master gardener Le Notre, a real-life figure who designed the actual gardens of Versailles. He is so underplayed, in fact, that when his jealous wife, with whom he has an open understanding, attacks him about his feelings for Sabine, I was genuinely surprised, as I hadn’t noticed anything between the two. When things do flower between the green-thumbed pair, it is tender and romantic. While this movie lacks somewhat in the drama department, it is often quite moving. What’s missing from the big picture is nevertheless visible in the individual scenes. Stanley Tucci plays the King’s brother Philippe, and he and his wife befriend Sabine as well. Her guileless nature and great intelligence help her find favor in the court. If this movie has a fault it is that, aside from the horrible events that occurred before the action of the film and continue to haunt Sabine, only good things happen to her. Le Notre’s wife gets really jealous and tries to sabotage her, but it is resolved quickly. Otherwise, everyone she meets is basically crazy about her. A scene in the court Fontainebleau is particularly beautiful when, accompanied by the King’s mistress and a host of other women, she can speak openly about the loss of her child for the first time. The sympathy among the women, able to talk naturally among themselves in a rare occasion, is very moving. “A Little Chaos” — which makes no sense as the title, by the way — could have benefited from a little more chaos, a little more peril, but there were also scenes and images that I will remember for a long time. 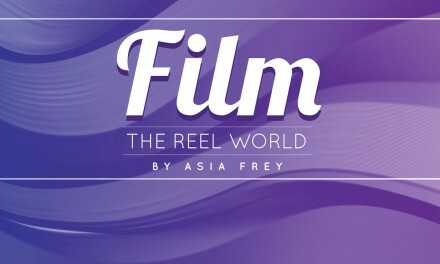 While the plot might sound like a run-of-the-mill costume snooze, the actors bring it to life so that the esoteric customs of the past make sense among real people.